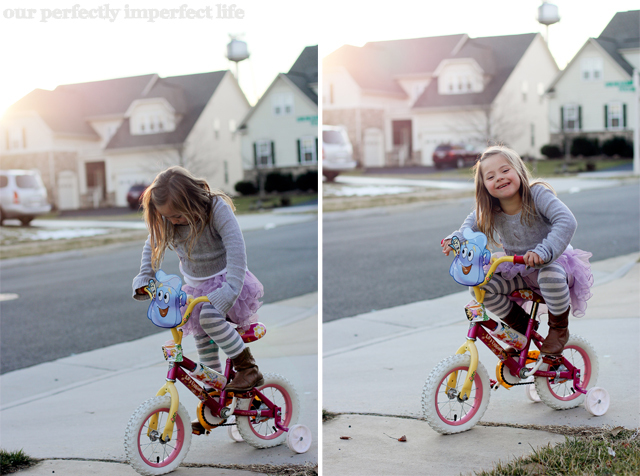 our perfectly imperfect life: a letter to parents. At the beginning of the school year, I had a lot of anxiety over Payton's relationship with the other kids in her class. The same old worries... would they like her, would they play with her, would they consider her a friend, would they be helpful to her... or would they shy away from her because they see her as different than them. I went back and forth, trying to decide whether or not to send a letter home to the other parents in her kindergarten class. I bounced the idea off of her teacher, bounced it off of my mommy friends... those with kids that have special needs and those that don't. The consensus was... it's a good idea. So... Kyle and I drafted a letter. It was hard... mostly because we didn't want to come across as crazy overbearing parents... and we wanted everyone to know that we are an open book. That we understand that most people don't really get what having Down syndrome means for Payton... and without being told, that they don't really know that our expectations of Payton are the same as that of her big brother. As we settle into this school year, we would like to take the opportunity to give you a special introduction to our daughter … Payton … who is in Mrs. xxxxxxxxx kindergarten class. Payton is a very independent, active little girl. She enjoys a wide variety of activities … playing house, reading and dancing … but mostly she just loves anything that involves being with her friends. She is a sports fanatic … thanks to her big brother … and she just completed tball season through the Greater xxxxxxxx Baseball League. 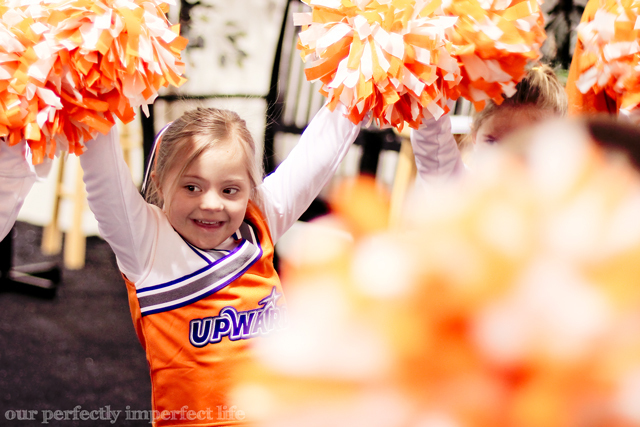 She also is in Daisies and will be cheerleading for basketball this winter through Upward. Besides being a very “typical” kindergartener, Payton also happens to have Down syndrome. Your child might come home wanting to know more about her and why she is a little different. Based on our past experiences, most questions from children this age are related to Payton’s speech and her inability to communicate effectively. Payton has Childhood Apraxia of Speech. While we are able to communicate with her well, it can sometimes be hard for others to understand her. She can talk, but Apraxia (a speech disorder) makes it hard for her to form certain consonant/vowel combinations. Sometimes she drops beginning sounds, sometimes ending sounds. Sometimes none at all. For example, she says “No” quite well. :) Or … “Max” will sound like “Ax” … “Milk” she cannot say at all (that l/k combination is very hard) and so she signs it (envision using your hand to milk a cow by squeezing). Payton works very hard in speech therapy several hours per week to conquer her speech delay. She has a long way to go, but she has come so far and we are so proud of her! Like most children, Payton has an insatiable curiosity and strongly desires to be independent … did we mention that? :) She is primarily a visual learner and will imitate what she sees others doing. We encourage you to share what you feel is appropriate about Payton with your children so that they can understand how she is different, but more importantly how she is the same as they are. Encourage them to support her without babying her, and to talk to her like they would anyone else, perhaps giving her a bit more time to respond and a little more explanation if she does not understand. They can also remind her to stay with them if they see her heading away from the group, and to make sure she is keeping her hands to herself. Research has shown that children with Down syndrome benefit from placement in a regular education class, receiving their education alongside typically developing peers of their own age. Regular opportunities to learn and play alongside typically developing peers gives children with Down syndrome the role models they need to acquire new skills, encourage age-appropriate behavior, and develop independence and friendships. Inclusive education benefits not only our child, but studies have shown that inclusion has a great benefit to the other children in the class. Inclusion facilitates greater understanding, tolerance, as well as learning to be supportive of one another. Children also learn to value diversity and to appreciate that everyone has something beneficial to bring to the life of the school and the community. We are grateful for your support and for the support that Payton will have in Mrs. xxxxxxxxx class. She will have a team of people that will help support her learning needs and facilitate the inclusion support. We are also grateful for the opportunity to be in a learning community together and look forward to meeting you (if we haven’t already) and working together for a great year at xxxxxxx. Children born with Down syndrome have one extra chromosome in some or all of their cells. The chromosomes contain directions that tell your body how to grow. 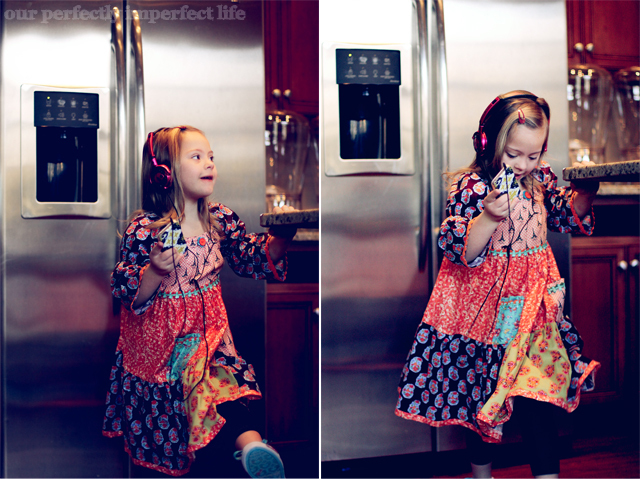 When a child has an extra chromosome it mixes up her body’s directions a little. That is why they may look a little different and have to try harder to learn. Will Payton always have Down syndrome? Yes, it is something she will never outgrow. Will Payton be able to do things like me? Yes, she will be able to do everything like you do, it may just take her a little longer to learn than most kids. She will learn to talk more clearly too, it’s just that learning to talk is often very hard, but just like anything, with a lot of hard work and practice she will get better over time. Payton also can do things you might not be able to do yet, like use sign language. Is Payton sad that she has Down syndrome? No, right now Payton is happy to be a growing little girl. She feels successful in her life; she loves to learn new things, just like you and me. You’re fortunate to be growing up in a world where people understand that everyone is unique, but that we all enjoy and want the same things, like having loving families and friends, going to school, and being accepted for who we are. We received great feedback after the letter was sent. I think some of the parents (maybe all, I have no idea) appreciate our transparency. And well... we appreciate them more than they know... and we appreciate them having that conversation with their child. Kids don't know what they don't know... and we are so thankful for the amazing kids that Payton has in her class this year. It has made her being included in general education so much easier... so if you are reading, thank you. So awesome and so brilliantly communicated! I am totally going to channel this when we encounter Kindergarten in a short 1 1/2 years. Thanks so much for sharing. This is fantastic! You are amazing! This was a great letter, so well written but not overly "complex". Thank you for sharing! This is such a great idea. I think I should consider doing something similar when my little guys enters preschool this year! awesome! thank you so much for sharing Bethany!!!!! That letter is awesome!!! It covers everything...should really do something like this for Avery..maybe ill do it when she starts kindergarten next year!!! I love this and might have to copy when Isabelle starts school. That is one of my big worries and you guys seeemed to cover everything. She is beautiful! What a great letter. Jake is now in an inclusive type school situation and has his own aide. He stuggles with speech. When I skype him he is harder to understand then when I am with him. He is learning to read and becuse his fingers are still weak, ( He goes to OT & PT every week), his spelling test is to pick the correctly spelled word from a choice of three.Saturday a friend from his class come to the house to play. His friend has no disabilities and I think it is so wonderful of Jake's step-mother and this other Mom to take the time and effort to do this. He is treated like all the others in his class. GREAT letter, thanks for sharing it, Bethany!!!!!!! Thank you yet again for sharing the example of your girls with the world. The beauty of your family is perpetually astounding. I L.O.V.E. T.H.I.S!!! Thank so much for sharing, I may have to come back to this in a few years :) and seriously, Payton is a doll face! Super letter!! I was just saying to a friend that right now Em is in preschool and I have been totally spoiled! it has been amazing! She is in a spit class with her typical peers and other children with special needs. Life there is blissful! But when it's time for kindergarten I feel things will change. Your letter is superb! And if I were on the receiving end of it, I would have greatly appreciated it. http://aaronshust.blogspot.com/ and he and his wife just had their 3rd son and believe he has Down Syndrome. He's still in NICU. Anyway, I posted a message on his blog the first day and directed him to your blog because you're so informative and positive. I don't know if he'll visit or not because he's had about a million posts thus far, but you never know!!! But, I hope he does because a post like that is just what he and his wife need to see! I loved this letter, we decided not to do a letter for our son, but the teacher did a whole unit on differences. THey loved it, his small stature due to dwarfism was no different then someone's curly hair! We do believe like you that being open to questions, and not hiding the fact that he is boviously different, but how amazingly alike he is really has helped. I love when the kids come up and say he is their favorite friend! Oh wow, I just saw this on the FB group. I love this as a mommy and a teacher. I'm saving this for four years down the line when I need to write my own! I just happened across this from a search regarding something completely different so I believe God led me here. My daughter is 2 and has Apraxia as well. It has been quite a tough year this past year trying to figure out what was going on with her but I agree with everyone's comments here this was perfect! I am definitely going to do something like this for when she begins kindergarten in a few years. I too feel its great to have the transparency and educate others so they learn more and appreciate the amazing qualities our children have to offer. I've learned SOOOOO much in this past year and love to share with others our journey as well. Thanks for this post! Loved it! <3 Thank you so much. :) And yeah, I giggled at your comment! My girls both had reverse inclusion preschool classes too... we loved it too! But yeah, things get so different. In preschool settings like that, the SN sort of rule it. In kindergarten, it's the other way around. :) I'm sure Em will do great!! Aww, that's awesome! I can't wait to read your blog ... I read the Johnson family's blog ... love them!! Great letter - I had the same internal debate at the beginning of kindergarten this year and couldn't come up with a valuable letter for parents although I did do an "All About me Packet" for the teachers that was really well received. Maybe next year I will steal your letter!!! Absolutely beautiful!!! You are an awesome mom! It's no surprise that you were blessed with such a special little girl!!! ( this letter is the only proof I need). I pray that I can be as eloquent as you were when my 3 month old enters the world of education! Little Payton is a doll! I might have to plagerize your letter heavily next year! That is a great idea, and well executed. Is Payton in full inclusion? We kept Charlie in preschool an extra year, and are considering SO many options for next year, but leaning toward inclusion. plagerize away! :) yes, she is included 100% of the time. dang, i can't remember what i have said and not said about her placement. i have to do an inclusive post of all of that. okay...i will also be stealing this when it comes time for miss maggie rae to start school :) you did it just perfect! Candor is key to understanding situations we are not familiar with. Well written and it seems you have inspired others to do the same! What an activist! Great letter and thanks for sharing it!! Oh. my. goodness! I did exactly the same thing! This is such great advice to parents and worked wonderfully for us when we did it 4 years ago when our Mylie started school. In fact, I just got around to posting about it myself (scheduled to post on Thursday), because I realized that it might be helpful to other moms. Do you mind if I Pin this for others? I don't mind at all... thanks!! Beautifully done! I will definitely write a letter similar to yours once my little one starts school. Thank you for sharing! Found it again! I remembered this letter, and came searching because I needed inspiration for my own letter. I hope you don't mind if I borrow liberally! Your letter is really well written!